Like many issues from this time period, this one’s cover stands out quite a bit to me. I don’t know that I’d call it a favorite–there are definitely plenty of covers I like more–but I do really like this and it’s instantly recognizable to me. This issue picks up where Superman #74 left off, with Superman chasing after Doomsday, blocking out Mitch’s cries for help. The transition, though, isn’t quite as smooth as the one from Justice League America #69 into Superman #74, though it isn’t jarring. Mitch narrates–describing the situation and letting us know that the rest of the League has fallen, Superman’s a distance off but still visible (and his punches against Doomsday audible), and his mother and baby sister (as well as the rest of the League) are still in danger from the collapsing house that’s burning. Superman finally returns after shoving Doomsday into the soft earth at the bottom of a lake, and Bloodwynd makes a timely return to assist as well before teleporting away to avoid medical attention from EMTs. 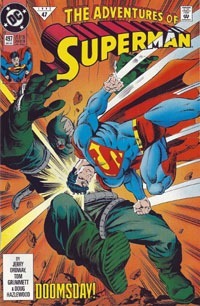 As a military helicopter targets (and is targeted by Doomsday), Superman’s back in the fray, continuing to save those he can while beating on the creature. Taking a moment away from all this, we get a scene of Lois in the GBS building, meeting up with Cat while she tries to find Jimmy. Olsen’s moonlighting as Turtle Boy for a kids’ show, but taping’s run hours late…and Jimmy is needed on assignment (covering the Doomsday situation). The battle rages into a small town where Maxima catches up to Superman and Doomsday, and her contribution leads to a huge explosion. The Guardian arrives to find her and Superman knocked out from the blast, and Doomsday nowhere in sight. Brushing off Guardian’s lecture on violence, Superman realizes this is his fight, and his alone. I’d forgotten about Grummett‘s time on this title, given the changeover around #500…I really like his art, and it looks especially good–and familiar–here! The art team is fantastic, and though it’s been quite awhile since I’d’ve thought about it, I think I’d have to say that offhand, this is my favorite Superman art next to Dan Jurgens‘ work! This issue begins the subtle "countdown" I had never noticed until about 10 years ago: the issue is done as 4-panel pages (with the next chapters having three-panel pages, then two-panels, before the conclusion in all full-page splashes). Story-wise, nothing really jumps out at me as any sort of "Ordway signature" or such, except that as with the other creative teams’ work, this plays very tightly with its sister titles. While not quite as "involved" at this point due to their encounters with Doomsday, it’s cool to see stuff play out with the League still being present in the title, if not much else. Guy Gardner grabbing Superman and essentially giving his ‘blessing’ (or command) to put the creature "in a pine box" strikes me as rather poignant…Guy admitting that Superman’s "tougher" and capable and such to do what he–Guy–was not able to. And a sort of quasi-reconciliation between the characters before what’s about to go down goes down. This is yet another issue that’s very much a piece of the larger story…even if ultimately, the story’s a huge "fight scene" of sorts, when looked at most broadly. This chapter isn’t really "essential" to the whole, offhand (maybe the first chapter to feel that way)…but there’d sure be a clear gap in stuff if we didn’t have this chapter. Outside of the pretty cover, I wouldn’t really recommend this as a "single" issue, but it’s well worthwhile as part of the whole, and definitely not a chapter to arbitrarily skip in a collected volume. Superman is chasing Doomsday, determined to foil the beast’s escape. To stay on his tail, though, means leaving the broken and battered Justice League–as well as an innocent family–behind. Superman makes the only choice he can, praying that Doomsday won’t cause too much destruction while the family is rescued. When the battle is rejoined, a small town pays the price. 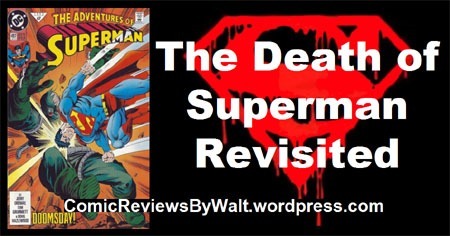 We get a moment of downtime as Lois storms GBS in search of Jimmy, who is needed for an assignment–covering this battle that Superman’s caught in. Maxima returns from rescuing Blue Beetle, and with little regard for innocents caught in the crossfire, eagerly wades into combat with Doomsday. 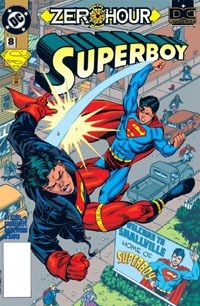 A familiar figure–arriving too late for this battle–confronts Superman over the town’s destruction. This middle-chapter isn’t much of a stand-out. In fact, the way it stands out is by doing what I have done–reading one issue at a time, in single-issue format, rather than the collected volume. Otherwise, this blends in with the overall story–which on the whole is good, but of little distinction as a single-issue. The story’s consistent–I don’t ever feel like I’m reading a different writer’s take on Supermn than the previous chapter…this simply reads AS “Superman,” despite the creative team shift. The art is high-quality, and where I don’t recall noticing it all those years ago when I first read this, for this go-’round I’m looking for it, and do notice that it is different. It’s got a certain clear linework to it that makes the characters stand out, and packs emotion into character faces. Maybe not the best issue of the story, but just as strong as the previous chapter, doing everything a middle chapter of a serialized story is supposed to. This issue begins the final “countdown,” as we move from variable panels-per-page to a structure of 4 panels, and successive issues will have fewer panels until the finale with each page being a single-panel splash-page.